It’s always important for traders to remember that stocks and companies are different. There are great companies and there are great stocks. But, it’s possible for a bad company to be a great stock and it’s possible for a great company to be a bad stock. From a trading perspective, it is important to distinguish between the great stocks and great companies. Many traders will hang on to a stock, or even buy it on a decline, if they believe it is a great company. This can be especially true with economic companies that are household names. Campbell Soup Co. (NYSE: CPB) is an example of a great company that might not be a great stock. Consumers may buy their products but the stock price has been in a down trend for some time. And, the stock fell more after announcing its latest earnings. The company reported earnings per share (EPS) of $0.95 cents. EPS, adjusted for one-time gains and costs, came to $1. This beat the expectations of analysts. The average estimate of six analysts surveyed by Zacks Investment Research was for EPS of $0.81. Revenue of $2.18 billion for the quarter also beat expectations. The analysts surveyed by Zacks expected revenue of $2.17 billion. According to Bloomberg, the selling pressure in the stock came after the company detailed another decline in soup demand, hurt by a dispute with Walmart Inc.
“U.S. soup sales dropped 7% last quarter, the company said. It blamed an ongoing issue with a “key customer” — previously identified as Walmart. The world’s largest retailer, which sells more groceries in the U.S. than anyone else, has been paring its inventory of packaged foods. While it copes with the soup slowdown, Campbell is seeking other sources of growth. In December, the company agreed to buy Snyder’s Lance in a bid to push deeper into salty snacks — a bright spot in a broader packaged-food slump. Campbell, which already makes Goldfish crackers, will get brands such as Cape Cod potato chips and Snyder’s pretzels as part of the deal. Now, Campbell has been a great stock for some time as the next chart shows. Long term investors have enjoyed large gains in the stock. Since 1947, the stock delivered a total return of as much as 9,470%. But, for now, traders are likely to step aside and pursue more promising opportunities. That creates a potential income opportunity in CPB. In the short term, CPB is unlikely to move much higher. To benefit from the expected weakness in the stock, an investor could buy put options. But, high prices on put options suggests an alternative trading strategies. The option premium is high because the expected volatility of the stock is high. Options that are based on selling an option can benefit from high volatility. Selling options can involve a great deal of risk. 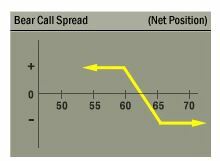 A spread best option trading strategy can be used to limit the potential risk of the trade. For CPB, we have a number of options available. Short term options allow us to trade frequently and potentially expand our account size quickly. Short term trades also reduce risk to some degree since there is less time for a news event to surprise traders. In this case, we could sell a March 16 $46 call for about $0.60 and buy a March 16 $47 call for about $0.20. This trade generates a credit of $0.40, which is the difference in the amount of premium for the call that is sold and the call. Since each contract covers 100 shares, opening this position results in immediate income of $40. The credit received when the trade is opened, $40 in this case, is also the maximum potential profit on the trade. The maximum risk on the trade is about $60. The risk is found by subtracting the difference in the strike prices ($100 or $1 times 100 since each contract covers 100 shares) and then subtracting the premium received ($40). This trade offers a potential return of about 67% of the amount risked for a holding period that is about one month. This is a significant return on the amount of money at risk. This trade delivers the maximum gain if CPB is below $46 when the options expire, a likely event given the stock’s trend. Call spreads can be used to generate high returns on small amounts of capital several times a year, offering larger percentage gains for small investors willing to accept the risks of this strategy. Those risks, in dollar terms, are relatively small, about $60 for this trade in CPB. These are the type of strategies that are explained and used in stock trading tips Options Insider service. To learn more about how options can be used to meet your goals, click here for details on Options Insider.